With finals and winter break just around the corner, December is a time to reflect on 2016 as we prepare for the new year. This is the fourth edition of Clarion’s This Bulldog Life: Reflections. Reflecting back on who we are and what makes us that person gives insight into what RB students are like. Every student is different in their own way. As RB students, we change throughout the time we spend here. We lose friends, gain friends, meet new people, and along the way our personalities change and so do our interests. Recently, students we interviewed reflected on who they are and what makes them that person. Environment has an effect on who a person is and who they become. “I would say I’m social, pushy at times. Not living in the suburbs and having to grow up quick shaped me into the person I am,” said freshman Brandon Aguilar, who grew up in the city. For many, what they want to do in the future speaks to who they are. “Family is important to me and I want to be able to take care of them. One of my goals is to go into the military,” said Aguilar. In some cases, students say they became who they are by the things they want in life. “I am fun, eccentric, creative and very humorous. Root beer and chicken wings changed my life forever; it made me who I am today. It was magical. I may never know why, but it did. My goal in life is to win an Oscar, but I am not yet near that goal,” said sophomore Joseph Kelly. 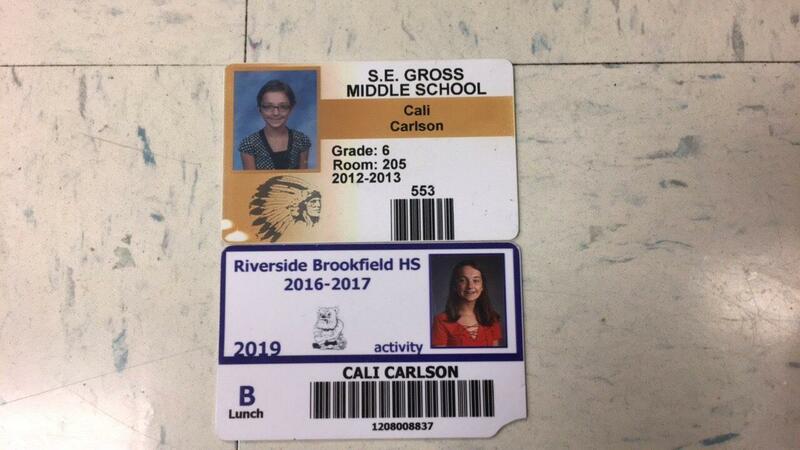 Sophomore Cali Carlson's change from middle school until now. Going from middle school to high school can be a tough transition for some. However, everybody has one thing in common: they are not the same people they were in middle school. “I have become nicer to my friends and a lot more accepting of people’s differences,” said senior Rosie Nolan. Freshman Ben Harrison believes he has changed because he feels as though he has more weight on his shoulders in terms of academic performance, which caused a slightly stressful transition. “I worried about my GPA because my parents are basically telling me that will define my school life. They tell me that grades are what you should really worry about,” said Harrison. Sophomore Cali Carlson has grown socially because she realized that she needed to start making better decisions with who she associates herself with. “The main way [I changed from middle school to high school] was probably realizing who is there for me. I learned I needed to drop some bad friends and have made many others in their place,” said Carlson. Nolan said her transition from middle school to high school went very smoothly. “That was four years ago for me, but it was really easy for me because I think I was really ready to just go,” said Nolan. Carlson’s switch of schools started off a little rough, but then got easier as the year progressed. “It was difficult at first, but I feel like it got easier as I began to know the school,” said Carlson. Depending on who you are, you might struggle with different things in high school. However, for all of us, high school is a time to reflect on our weaknesses and build on our strengths. The 2016 – 2017 school year at Riverside Brookfield is halfway complete. A lot of things can change in four months when you spend most of your days in a learning environment. The start to a new school year can be tough or surprisingly pleasant. The transition from one grade level to another can be rough at first, especially if your mind is still stuck on summer. For most students, summer is an escape from all academic work and time for relaxation. “The beginning of the school year was alright, but I was sad that summer came to an end,” said sophomore Leah Rettke. Summer is only one of the few adjustments students at RB have to face. Coming into the school year can be difficult if you are not prepared for a rigorous academic schedule. “It was interesting to see my classes this year from last year in comparison to difficulty,” said sophomore Maddie Meehan. Students can reflect on their past years at RB not only academically, but also in terms of extracurriculars. In any extracurricular activities, time and commitment are the most important responsibilities a student has. “I’ll be spending most of my nights studying, although I am dedicated to basketball,” said Meehan. Entering a new school leads to new people and friendships. One great thing about RB is the diversity within students. “I met new people and it feels good to expand me relationship with different people,” said Rettke. New people in your life will make you reflect on topics that you are not aware of that maybe the other person is educated on. The school year will always be changing because many students are changing as the year progresses. “I got to meet a lot of new people and I was really challenged in learning things I haven’t talked about before,” said Meehan. At this time of the year, students are waiting for winter break and also dreading semester one finals. “I’m feeling very stressed for finals, but I plan on studying for all of my exams,” said Rettke. At this point in the year students can think about how to prepare for next semester and even next year. Students at RB can reflect on previous years for guidance and memories. “I will be able to take my study habits I acquired this year and move them to the intense course I picked out for next year,” said Meehan. 2017 is just around the corner, and a tradition nearly everyone participates in is to reflect back on the prior year and set new goals to improve the upcoming year. Two English teachers, Wendy Cassens and Kimberly Hayes, both have been serving at this school for a combined 50 years and have dedicated most of their teaching career to RBHS. We asked them to reflect on teaching when they started versus teaching now. 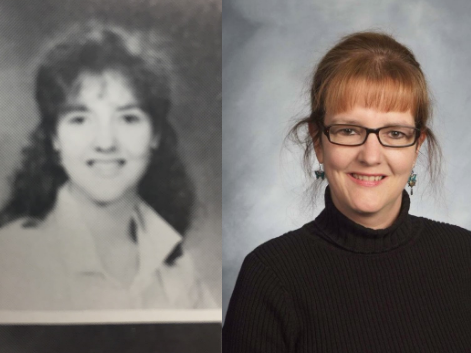 English teacher Wendy Cassens in both 1995 (left) and 2016 (right). “Some things are the same. [For example,] students don’t like being told what to read and write about,” Cassens said. Many things have changed for the two teachers, such as the use of technology. Like anything new, the introduction of technology into the classroom has both helped some problems while presenting others. “What’s different is the number of distractions that dissuade them from their work. Technology has caused some problems, but it has also helped. Students can now look up things at the touch of their fingertips,” Cassens said. Both Cassens and Hayes have also developed new teaching techniques. However, some teachers have stayed with the same process they have used for most of the years they have been teaching. 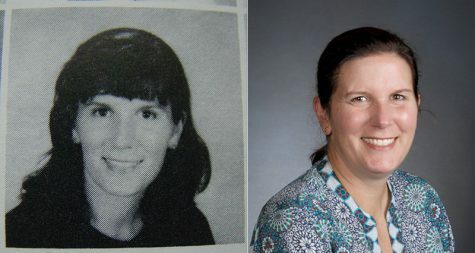 English teacher Kim Hayes from 1986 (left) to 2016 (right). “Throughout the years, the profession [of teaching] has tried to become more student-centered and less lecture-based. The one-to-one technology has certainly been a change all of us are adjusting to,” Hayes said. In order to have students enjoy learning, a teacher needs to be active and willing to give the students a chance to guide their learning, according to Mrs. Cassens. One goal of teaching is to make sure your students leave the classroom with more knowledge that they came in with. Both teachers believe that their teaching methods have changed, and not so much the students. “What has changed is not so much the students, but how people view the teachers. Lots of people don’t believe we’re professionals,” Cassens said. Many teachers like Hayes hope to improve just a much as their students, and always hope their students strive for success. “I’ve always strived to help students grow as writers and to delight in well-written literature. That goal remains, because writing is still so important. I just hope I’ve grown in doing a better job at that,” said Hayes. Teachers are always working to help their students perform and learn in the best way they can. Students do not change very much; however, it seems that the way a teacher thinks, teaches, and acts in a classroom has certainly changed over the years. Most people at Riverside Brookfield could agree that the way they are now is nothing like they were when they were first starting off at the school. Those who have been here longer have had more of an opportunity to grow over the years. Halfway through their final year in high school, RB’s seniors in particular are beginning to reflect back on their time at this school and the changes it has caused within them. As many would agree, coming into a new school where you don’t know as many people can be nerve-racking. Throughout several years of high school, many things can happen, both good and bad. Everyone has different experiences that could affect them and ultimately impact who they are. “The process of gaining and losing friends, that will change you as a person; I know that I’ve grown a lot losing certain friends and I’ve gained a lot of experiences and knowledge of the world around me just with being introduced to new people,” said Segarra. Throughout the years of being at a school with so many people, it is inevitable new people will be met and relationships will be made. “Meeting a bunch of new people with different backgrounds [who] like different things has helped me become more open to trying new things and more accepting and understanding of other people,” said senior Zach Mieczkowski. All the opportunities high school has to offer will have positive impacts on people over the years. “I’ve become more confident in myself and everything that I’ve done and I’ve made a lot more friends and grown in the way that I choose my friends and the people that I spend time with,” said Brom. Things aren’t always going to be easy, and throughout time everyone is bound to experience some hard times and negative influences, just like RB’s seniors have over the years. “Life is not always gonna be easy and the things that you face are gonna require a lot of perseverance and hard work to get through,” said Mieczkowski. Despite the hardships that people experience from time to time, there are lessons that can be learned even from the negativity. “There have been some negative people who have come through RB, but that has showed me how to be the bigger person,” said senior Lyndsey Hoyd. Along with the bad times, and even more so, there have been good memories for those who have gone through RB, especially those who were involved in clubs and sports, doing things they love with people who share similar interests. “I’m the head choreographer on poms, so that gave me responsibility to choreograph and be a leader,” said senior Kaileen Gilhooley. Besides sports, RB offers many clubs that the students can get involved in. Our seniors would not have become who they are today without help from others at this school, especially the teachers. “Mr. Monti has helped me with test taking and Mr. Jensen helped me with… everything,” said Gilhooley. “With Mr. Bonarigo, it started off kind of [as a] weird relationship, but then through the years I’ve had him, he’s always helped me out with anything I needed,” said senior Patrick Goodwin. The teachers at this school have had a huge impact on the lives of the students that have come through this school. Many have them have formed really strong bonds with their students. “My freshman year English teacher, Mrs. Cassens, was really good at being a mother figure in school and she kind of made me feel at home,” said Brom. After having been through it all and gaining the knowledge and experience, our seniors know what they need to have a good high school experience. “Get involved, do as much as you can, and don’t take it for granted. It goes by really fast,” said Hoyd. Besides taking advantage of the time you have at the school, it’s also important to do well academically. “Have confidence in yourself no matter who you are and seek as much help as you can from any of your teachers; your grades are more important than anything,” said Goodwin. Even long after they’ve left high school, RB’s seniors know they’ll never forget their time here and how the experiences they’ve had affected them. “I’ve had some of the funniest and best times of my life in the school,” said Goodwin. After meeting so many people throughout the years, the memories made with them will definitely be remembered. “I’m always going to remember the relationships I had with the people that I met whether it’s coaches teachers or other students,” said Mieczkowski. Everything that these students have taken from high school will be with them throughout their lives. All the knowledge they’ve obtained as well as the experiences they’ve gained will help them as they begin their future. “Aside from all the knowledge I’ve gained, I will definitely remember the memories from class and all the people I’ve met and my teachers who have prepared me for my future,” said Hoyd. As time goes by RBHS is filled with various types of people. Throughout the years, the school, staff, and students have all changed. Former students could not wait to leave high school and never look back. However, some love RB so much they have decided to come back and work here. Mary Todhunter, an AV associate/media production specialist, went to Riverside Brookfield High School all four years and graduated in 1971. Todhunter was a cheerleader who was busy and involved with school activities almost every single day after school. “When I went here, there were about five girls on the cheer team and for poms there was about fifty something girls,” said Todhunter. Today, there are about twenty girls on the cheer team and about fifteen girls on poms. With time, sports, clubs, and people change. Different types of hobbies and activities have come and gone, but one thing that has stayed the same at RBHS is it’s love for being active, involved, and friendly. “I would say that almost everyday after school, everyone in school was involved in a sport or club,” said Todhunter. Students from the past were always busy, and their days were filled with homework, responsibilities, friends, and especially sports and clubs just like students of the present. However, for the girls there were not many options for them to do. The girls sports teams were not allowed to participate in competitions, they had the G.A.A. (Girls Athletic Association.) Now girls are allowed to participate in all sports allowed at RBHS. For example, the cheerleaders would only cheer at school games. Now, the cheer teams, varsity and junior varsity, travel to different high schools to compete and win high titles. Girls and boys now have equal rights to do the same activities. There are many ways for students of all grades to spend their free time. In the 1970’s, RB would have a popular band come and perform for students and faculty. “Once we had a band, The Turtles, and it was very fun. Almost every week there was a sock hop, and bands would come and play music and we would hang out with friends,” said Todhunter. A former student at RBHS, Geoff Tillotson, a para-educator, graduated in 1963. During this time there were a lot of gangs in Riverside. “We were not allowed to wear blue jeans in school because they were associated with gangs. Instead boys usually wore khakis, girls wore dresses, and no one ever wore shorts or sandals no matter what the season,” said Tillotson. Tillotson said he was not very interested in school related activities, but had a job at the Grilet. “It was the spot to eat at. I had various jobs. I was a soda jerk and I also worked the grill. It was also the spot to work at, everyone would try to work there,” said Tillotson. Spending time with friends and having fun seems to have stuck with RB as time has passed. There are many clubs at RB that provide the same spirit as sock hops and listening to music. High school is one of the most memorable times of one’s life. Although the students and staff may have changed, there are still many things to discover here at RBHS. Wow. That’s the word I would use to describe the year 2016. Yeah, there was the presidential election, which was what people would probably remember 2016 the most for, but let’s not forget the tons of other things that happened. The world had so many majors events involving sports, music, social trends, and that one incident involving a gorilla. A lot has happened that we tend to forget what happened in the wee early days this year. So let’s turn back the clock and relive some of the good, the bad, and the not-so-pretty moments of 2016. What in the wide world of sports went on in 2016? Certainly it was a year of underdogs and comebacks. NFL- Just in February we saw the Denver Broncos take on the Carolina Panthers in Super Bowl 50. Everyone was expecting a Panther’s win and a lot of dabs from Cam Newton, but the tables were turned as Denver took the title as Von Miller dabbed all over Carolina. Dak Prescott was a huge surprise as the 2016 season began. When Tony Romo got injured again, the rookie stepped up and helped lead the Cowboys to one of the best records in the lead. Prescott broke the record for most consecutive pass attempts without an interception to start a career with 176 surpassing Tom Brady. NBA- Lebron James and Cleveland Cavaliers defied everything as they came back from a 3 to 1 series deficit versus the Golden State Warriors who had the best NBA season record EVER (73 wins 9 losses). Truly it was a crazy turn of events and perhaps one of the most delightful or upsetting event in 2016 (depending what side you are on). If that doesn’t make a memorable event, the 2013 MVP Kevin Durant leaving Oklahoma City to join the Warriors will make it one. Some called it unfair and some called it awesome. Other notable events were the retirements of some great players including Kobe Bryant, who scored 60 points in his career finale. MLB- The Chicago Cubs won the World Series. I can’t believe I wrote that down but it happened. The Cubs came back from a 3 to 1 series deficit versus the Cleveland Indians to win the World Series for the first time in 108 years. National League MVP Kris Bryant, along Anthony Rizzo, led their team in one of the most nerve clinching Game 7s ever to claim the ever cherished World Series Trophy. The North Side will never be the same again. Soccer- Leicester City had a 5000 to 1 odds of winning the Premier League in the beginning of the 2016-2016 and against all odds, literally, they just did that. The team was led by Premier League Player of the Season and FWA Footballer of the Year Jamie Vardy, who led the team in scoring with 24 goals. NHL- In hockey, we saw the hometown kid Patrick Kane take home the Hart Memorial Trophy, awarded to the MVP of the NHL. We also saw Chicago Blackhawks’ Artemi Panarin awarded the Calder Memorial Trophy, awarded to the NHL rookie of the year, only to have their successful season spoiled by a first round exit. NCAA Basketball- In the NCAA Men’s Basketball Tournament, #2 seed Villanova played #1 seed North Carolina in one of the craziest NCAA Men’s Basketball finals ever. After a long three pointer by Marcus Paige to tie the game for the Tar Heels, Kris Jenkins of Villanova hit a three pointer at the buzzer to win the championship. Olympics- America dominated winning 121 medals in the summer Olympics. Michael Phelps added to his record gold medal, earning gold five times. Simone Biles was described as “dynamite” with her explosiveness in women’s gymnastics as she helped the team win gold. Crazy things have happened over the last year. Let’s look back on some notable events. #Clown Lives Matter- In the fall, Twitter went viral with people dressing up as creepy or scary clowns. Some say this was a public relations stunt for the upcoming 2017 remake of the movie “It,” but no one was exactly sure what caused the initial sightings. All the commotion caused actual clowns to protest there scary menaces. A “Clown Lives Matter” march was scheduled in Arizona, but cancelled due to death threats. Eventually, the clown sightings subsided and everyone moved on. Brexit- On June 23rd, the United Kingdom voted to leave the EU in a referendum. Over 30 million people voted and Leave won by 52% to 48%. Prime Minister David Cameron resigned that day, making room for Theresa May to take his place. Zika Virus- A new disease has come to the public eye as the Zika virus has started to spread among babies and pregnant women. The virus is caused by the infected Aedes species mosquito. The spread of the disease caused a conflict in those attending the Olympics in Rio de Janeiro. Orlando Night club- On June 12, Omar Mateen shot and killed 49 people at a gay nightclub in Orlando, Florida. Many thought Mateen was prompted to attack the club by ISIS. This was the largest terrorist attack on United States soil since 9/11 and received massive amounts of sympathy from people from around the country. Pokemon GO- Launching on July 6, 2016, the game gained massive popularity. Pokemon experienced a surge in relevance that it only had before in the Pokemon craze of the late 1990s. It lasted for much shorter, petering out in August-September of 2016. A free to play location-based game using augmented reality allowing players to walk around in the real world and catch the iconic creatures right on their device was the first of its kind and exactly what old fans were hoping to see with the new technology. VR- Short for Virtual Reality, it is a new genre of video games storming the market and bringing lifelike immersion with it. Its popularity has attracted gaming giants like Sony, Valve, and Microsoft, all with their own takes on the new market. Even Samsung and Google have capitalized on the trend with the Samsung Gear VR, Daydream by Google. U.S. and Cuba relations- Since the United States severed diplomatic ties with Cuba in 1961, much progress has been made. Namely, President Barack Obama visiting the country just this March, the first sitting president to do so in more than eighty-five years. Many restrictions on travel, banking, and remittances were eased. The first normally scheduled commercial flight landed in Cuba from Miami on November 28 for the first time in 50 years. Brussels Airport Attack- Explosions in the Brussel on Tuesday, March 22, 2016 killed 32 people. Two explosions were in the main terminal of Zaventum International Airport and one blast took place in the Maelbeek metro station, in the center of the city. ISIS was responsible for the attacks. 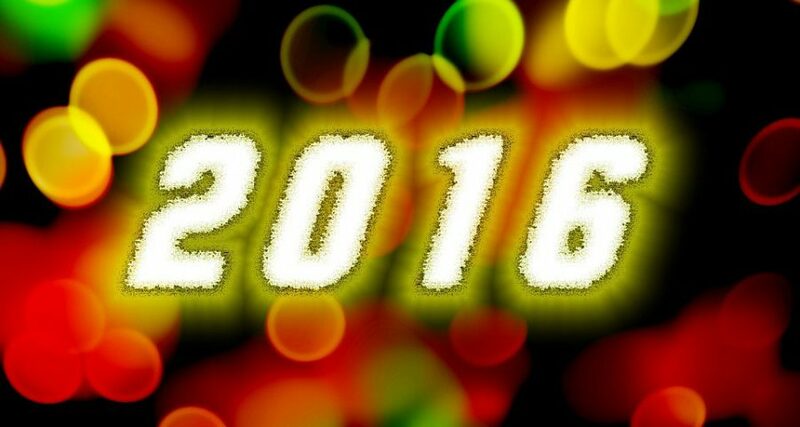 A lot of music and anticipated albums have come through this year. Let’s look at several of them. Many breakthroughs in technology that could make our lives better were made this year, along with various advancements. Immune cells that are genetically engineered are now saving the lives of cancer patients. New rockets can now land upright and be reused past their maiden voyage, making space exploration must more viable and efficient. Robots and AI can now learn things on their own and share those things amongst themselves. Tesla has delivered a software update to their cars enabling the first major step into autonomous driving. In Buffalo, New York, a 750 million dollar solar factory is in development that is able to make ten thousand solar panels in a day, and them being the most efficient solar panels in the market as of now. As you can see, there were many new cultural, social, technological, political, and societal changes and trends of 2016. Although it is time to turn a new page in 2017, we shouldn’t forget the important events and changes to our society that 2016 brought.